Pathways enveloped in greenery and an authentic heritage hearken one into Towering Trees at Beaux Arts Village, as majestic open spaces afford an understated elegance that pulls nature into focus. Glass wrapped rooms flood the home in natural light and lend themselves to a harmonious energy and flow. The creative vision of renowned architect James Cutler, no expense was spared in this 2014 custom design as organic materials and high-quality craftsmanship meet superb finishes. It draws inspiration from the old growth Douglas Firs that grace its grounds, which serve as an integral element that nods to the essence of a treehouse while honoring Chinese ancestry and a Pacific Northwest lifestyle. The main axis of the home extends from the entrance to the largest of the trees to set a tone of luxury and tranquility. Moving inward, the heart of the home lends itself to gathering and entertaining, anchored by the living, dining and kitchen. Cutler balanced expansive wood ceilings, twinkling lights and windows that evoke a sense of lightness, with heavier brick wings and steel beams to reinforce the role of nature and juxtapose the public and private. Creativity ignites in a state-of-the-art kitchen with a gas range and stainless steel appliances to meet every need. Watch the leaves change as the fire crackles and open vertical-lift glass doors to a south-facing traditional Chinese courtyard for a moment of respite. Radiating outward from the heart, two wings hold the master suite and bedrooms, a family room, study and guest areas. All bedrooms are ensuite and were envisioned as retreats that give privacy and infuse nature into daily life. The lower level includes a finished basement ready to suit your vision, whether it’s a fitness center, artist’s studio, media room or beyond. 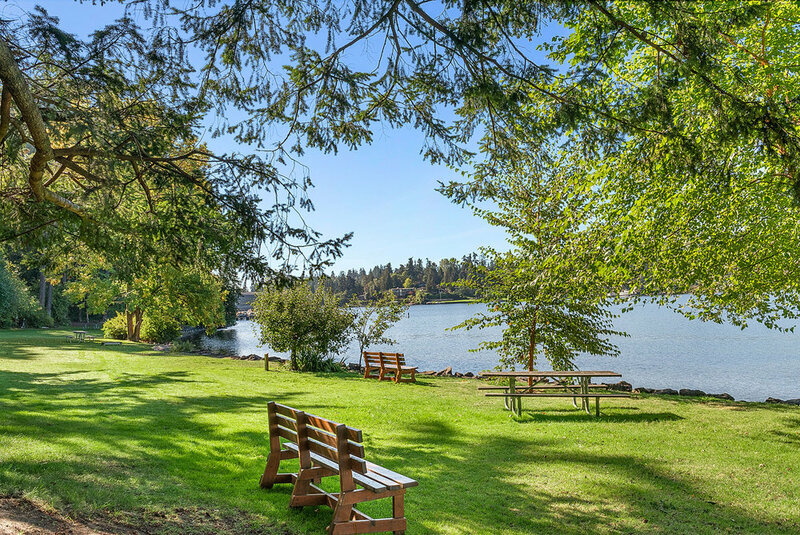 Located down a quiet lane, enjoy a position within the stellar Beaux Arts Village community, where residents often hop on golf carts to transport themselves to life at the water’s edge, with 1,000 feet of waterfront, a lakeside park, dock, boat moorage tennis courts and picnic areas. Additional features of the home include a two-car garage, security system, award-winning Bellevue schools and easy access to downtown Bellevue, the growing Eastside tech corridor, and I-90 to downtown Seattle.